The photo was taken at home after going through my son's beautiful seaglass collection. He is 8 years old and makes regular trips with me to the lake to collect seaglass, fossils, unique stones, anything that catches his eye. He has a very good eye for glass and sees things I miss. His collection comes from Lake Erie in Hamburg, NY - USA. The glass was collected over several trips to the lake as we live within walking distance to it. We usually go down after dinner or early in the morning on the weekends and it is usually sunny when we go. All of this was found this year-mostly this Spring. My son was very excited to take the photo of part of his collection and submit it to the website as he's never done it before. He chose some of his favorite pieces for the photo, many have numbers or patterns on them. The favorites are the ones with the fossils - he also collects some of the fossils that have actually imprinted into his seaglass so he kind of gets the full circle picture. The camera is nothing fancy. Just a Vivitar digital camera - no fancy lens. i was looking for beaches around my area, and came upon this page. Hamburg is about 45 min from Olcott where I am. I have quite a bit of sea glass that me and my boyfriend have collected the past two years. We are a walk away from the beach, so we often go, for sunsets and to get sea glass. I was looking for other beaches to check out. That's a nice collection your son has. 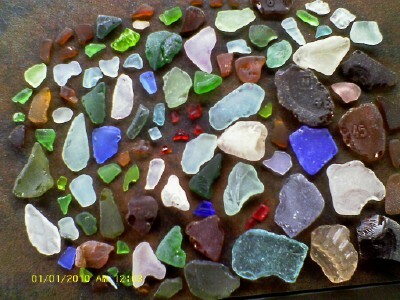 Now that i know another beach that has sea glass, I will be making a road trip! So many ideas what to do with them. i will be posting pic soon of my collection. Tell your son that I am jealous of all his beautiful beach "finds". I have grandchildren about your son's age and we love looking for sea glass and fossils on our annual vacation. Unfortunately, that is only once a year. You are so lucky to live within walking distance of a lake where you can find such unique treasures. These are moments, spent with your son that you will both remember forever.